'Treme,' Ep. 20: The Circle, Unbroken : A Blog Supreme No big plot twists shake up the penultimate episode of season two, but what does transpire reveals a lot. Recap the musical performances, featuring The Loose Marbles, Rosie Ledet, Jon Cleary and one of Destiny's Children. 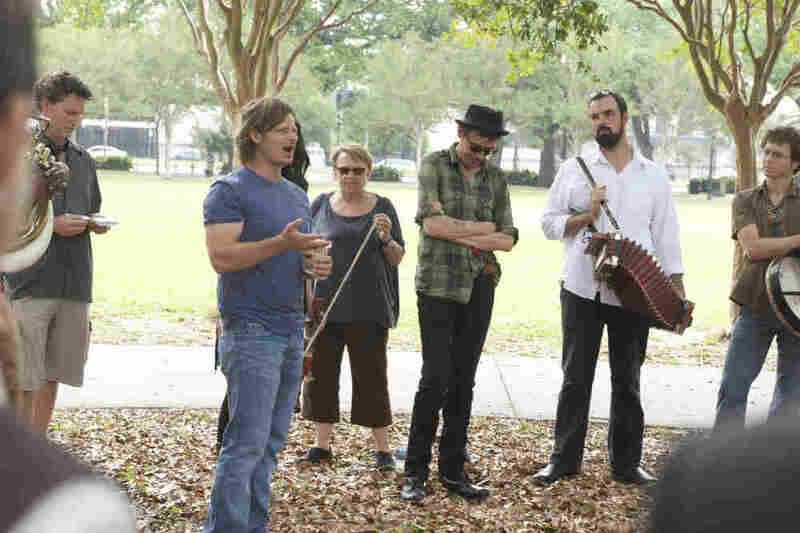 DJ Davis (Steve Zahn) address a crowd of musicians at Harley's memorial service on Treme. In season one of Treme, an important death took place in the second-to-last episode. It's a pattern we saw in The Wire — the previous HBO series from Treme's creative team — where writer George Pelecanos was drafted to script often morbid plot twists in penultimate episodes of any given season. This season of Treme, Pelecanos wrote episode nine (episode 19 in total) — where Harley is murdered — but the most recent installment, the last before the season finale, had no plot twists on such a dramatic scale. We do see how Harley's seemingly senseless killing fits into the scheme. It reveals more about his previously mysterious character, a composite of so many who have moved to the city to play music. It brings the police force, and Lt. Colson's character, back into the fore. And it will seemingly launch Annie's career as a solo artist, now that she's come into Harley's stash of original compositions. This episode is heavy on music scenes, though. Josh Jackson and I present our weekly discussion of 'em. Patrick Jarenwattananon: So who are all those musicians in the funeral gathering for Harley? I recognize quite a few who we've seen in the show before. I take it many of those folks have some experience on the streets, seeing as how Harley wasn't much of a club/indoor musician. Josh Jackson: Reverend Goat Carson officiates the ceremony at Washington Square Park in the Faubourg Marigny — where Harley was killed. Slim Jim (aka Spider Stacy) calls Harley the Human Jukebox 2.0, a nod to the late guitarist and bluesman Ferd "Snooks" Eaglin. Coco Robicheaux speaks after Davis. There are quite a few buskers among the attendees. Ingrid Lucia from the Flying Neutrinos is present. There's Washboard Chaz and clarinetist Doreen Ketchens. Doreen's husband, Lawrence Ketchens, is the tuba player. We also see musicians that crossed paths with Harley and Annie — accordionist Wilson Savoy and Susan Cowsill, who sings "Will the Circle Be Unbroken?" The most striking presence is that of long-time New Orleans street performers David Leonard and Roselyn Lionheart. They're wearing the hats with "Mo'Lasses." David and Roselyn are a great musical couple, and you can still find them on Royal Street whenever they're not in Europe or somewhere in the world. PJ: To put two and two together here, seems the show is making a point about New Orleans' music scene with Harley's character. When pianist Jon Cleary pays tribute in his solo set with "Frenchmen Street Blues," it's clear he's got an English speaking accent, but is singing about New Orleans. And the revelation at the end of the episode that Harley is actually from Bellingham, Wash., despite his Texas twang, doesn't seem gratuitious either. 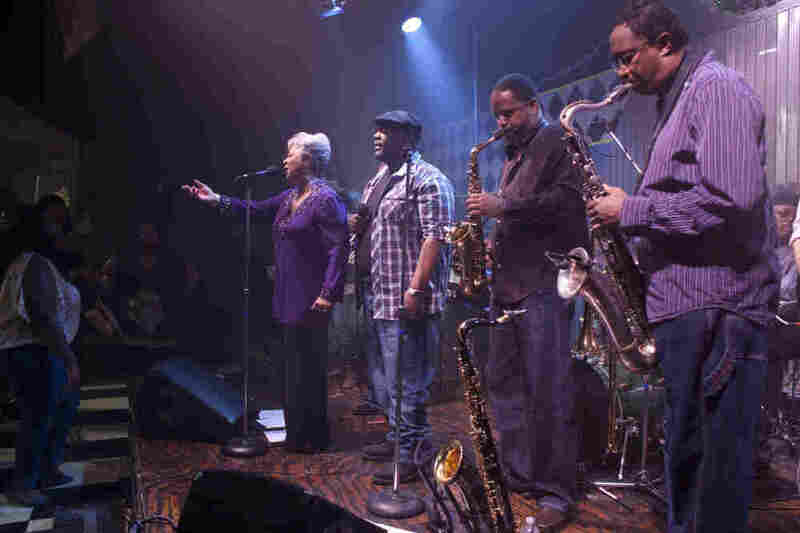 Perhaps the point is that even though New Orleans regenerates its own scene, a sizeable number of its musicians are from somewhere that isn't Louisiana. JJ: I thought that Jon Cleary's "Frenchmen Street Blues" really resonated with the storyline: "Scatter my ashes on Frenchmen Street, and don't be upset at the news." Wow. New Orleans certainly has a strong nativist music scene that has weathered the effects of acculturation. At the same time, the city has been a welcome place for visitors who have become permanent residents. Musicians come for the muse. Some never leave. Few cities have this type of inspired magnetism. PJ: Harley's comrades on the streets, the collective called The Loose Marbles, have parked outside the coffee shop where Sofia is working. They've got something of a trad jazz thing going on. And even though they're street musicians, they're increasingly well-known these days, I take it. JJ: We hear them play "Crumpled Paper" and "Look Out Mama." The Loose Marbles are a special outfit of street musicians. Many are conservatory trained. Their singer, Meschiya Lake, has a burgeoning solo career. They play a lot of early jazz, minor-keyed gypsy swing and old-time blues songs. They sometimes play summers in New York. Everyone likes to escape the oppressive summer heat of New Orleans. PJ: Switching it up, I like how they draw up the Davis character so that you almost feel a bit of schadenfreude for him every time his plans are foiled. Like when he's being told to cut one of his songs from his own compilation album in favor of his protege's song. Or when the Brassy Knoll rehearsal is crashed by the guitarist Alex McMurray. JJ: Alex McMurray is, along with Paul Sanchez, one of the most talented songwriters in New Orleans. He's also part of a group called Tin Men, with Washboard Chaz and Matt Perrine. Love that band. Alex was the leader of a rock group called Royal Fingerbowl, named after the moist towelette or wet-nap that accompanies many barbeque dinners. He also knows more sea shanties than most sailors. PJ: There's a zydeco band playing at the bowling alley where Nelson and his benefactor meet up. And it's led by a woman — which seems an unusual sight for that style of music. You know much about her? JJ: Mais yeah, cher! It's Rosie Ledet, "The Zydeco Sweetheart." She's singing "Pick It Up," one of her many tunes that have some kind of sexual suggestion. "Pick It Up" is about daddy taking erectile dysfunction pills. If that song makes you dance for more than four hours, consult a doctor. Rosie is a frequent performer at Mid-City Lanes Rock-n-Bowl, one of the only places I know where you can get your two-step and your bowl on at the same time. Brooklyn Bowl is a similar venue in New York, at least in spirit. The old Rock-n-Bowl location at Carrollton and Tulane Avenues was a trip. You could hear great acts like Snooks Eaglin and Eddie Bo, listen to pins fall and feel the floor literally shake from folks dancing. PJ: Speaking of Nelson, is that an actual blues guitarist who he's trying to persuade to sell his home? (His "life savings," he says.) And speaking of cameos, that's Harold Battiste at Dooky Chase's restaurant on Holy Thursday, huh? JJ: That bluesman is Chris Thomas King. Some folks will remember him as the bluesman Tommy Johnson in the Coen Brothers' film, Oh Brother Where Art Thou?, or Lowell Fulson in the movie Ray. Chris is the son of Tabby Thomas, a blues musician who ran a real juke joint in Baton Rouge called Tabby's Blues Box. Then at Dooky Chase's — Since 1941 — we get an opening interior shot of a table with Jacques Morial, a son and brother to two former New Orleans mayors, with Tom Piazza and Lolis Eric Elie, two of the local writers for Treme. Harold Battiste is one of the living legends of New Orleans music. He's talking about the variations on the last name, Batiste (Antoine, pianist Jonathan, clarinet player Alvin etc) being a different family than his own. You can also find some Baptiste families in New Orleans. This can be a little confusing for folks outside of New Orleans. PJ: The Delmond storyline continues in New Orleans. He's now deep in the red, borrowing money from his agent to book too much studio time for a record which will only sell modestly. But at least they got a satisfactory take off in the eyes of Albert Lambreaux. And they had the services of percussionist Uganda Roberts. JJ: Maybe he can name the record Deep in the Indian Red, right? Bad puns aside, he's making Big Chief Albert Lambreaux a happy man. "Hu-Ta-Nay" sounds good with the addition of Uganda Roberts on congas, but he could have simply overdubbed his percussion over the tracks from the New York session. Anyway, jazz records today are more often documents than they are commercially viable products, so at least Delmond will remember the occasion. He'll certainly have a long-term reminder as he pays for the cost of the recording. Reminds me of that old adage about how to make a million dollars in jazz: Start with two million. JJ: It used to drive me nuts to hear radio jocks talk over blues music with a response to every phrase. That's what Antoine is doing here, except he's interrupting Wanda Rouzan. And she's not having any of it. I think Antoine should consider expanding the type of material, especially if he plans to keep Desiree in check. I'd limit the amount of times they played the Billy Paul/Gamble and Huff classic "Me and Mrs. Jones," for sure. It doesn't help that his eyes say a little too much. Also, did I hear Iggy Pop's "The Passenger"? The Soul Apostles are dipping into punk now? Stanger things have happened, I guess. PJ: Finally, the episode ends with LaDonna and her husband in bed — and she is still reeling from the long chain of events since her assault (and since the storm, really). Then we get John Mooney's "That's What Lovers Do." Any other background music you noticed in particular this episode? JJ: I did enjoy hearing Janette singing The Meters' "They All Asked For You" while she worked. Every kid who grows up in New Orleans or has been to the Audubon Zoo knows that one. In another scene with Janette and David Chang, I heard Talking Heads' "Drugs" in the background. Let's hope that kids don't know that one.